STUDENTS at SMS Institute of Technology in Lucknow are desperately waiting for mechanical engineering professor Bharat Raj Singh—to see his motorbike that runs on air. Fondly called hawai (airy) professor, Singh has built the engine and is working on the bike design with Onkar Singh, mechanical engineering professor at Harcourt Butler Technological Institute, Kanpur. The engine is a breakthrough in clean technology innovations; it uses the readily available air to generate energy and does not pollute. What is more, a motorbike powered with the air-engine can run at 70-80 km per hour and cover 40 km just for Rs 5. “Our effort was to create an engine as efficient as conventional bike but without the adverse effects of its internal combustion engine,” said Raj Singh. The professor duo has applied for a patent for the technology. The engine has two components: an air tank and a turbine. Air is tightly filled in the tank using electricity or by pedalling. 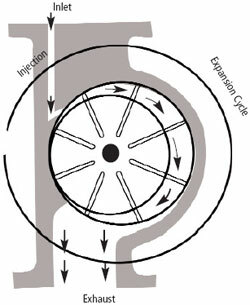 When required, the compressed air is passed through an inlet port to the turbine, where it impinges on the turbine vane and creates a rotational force, or torque. The rotational force is used to drive the bike, while the spent air is released to the atmosphere, explained the professors who did not wish to divulge the details. But the compressed air can exert different rotational force depending on the angle at which it sets the vane in motion. To find the optimum force, the professor duo took the help of a mathematical model. The engine is at its best when the turbine has 10 vanes at an angle of 36o each and the compressed air is injected at an angle of 60o on the vane, they noted in the Journal of Renewable and Sustainable Energy on May 6. “The air-engine is 70-90 per cent efficient,” said Raj Singh. Internal combustion engines used in fossil fuel-powered bikes are 18-20 per cent efficient. It may, however, take them another four to six months to develop a vehicle that could be put to commercial use. The challenge lies in the size of the air tank that are big to be fitted to bikes. The engine, in its present design for lab-testing, holds 20 bar of air pressure, sufficient to be used for 30-40 minutes or run 30 km. “We are trying to use a fibre tank that can sustain up to 300 bar air pressure so that the bike can run five to six hours or 200 to 250 km in a single fill,” Raj Singh said. This would be light and can be easily fitted to motorbikes. The duo are optimistic about the technology, especially for two-wheelers. In India 77.8 per cent of vehicles are bikes. But is not developing an air-engine common in engineering colleges? In 2009, four students of Guru Nanak Dev Polytechnic College in Punjab developed an air-engine. It had three air tanks, weighing about 180 kg, and could give a maximum speed of 18 km per hour. “It could not give much speed because the air-tanks were made of steel and hence were heavy,” said Jagraj Singh Kaul, head of the automobile department in the college. The students wanted to replace them with carbon fibre tanks, but could not because of monetary constraints, Kaul added. 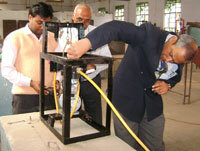 A similar air-engine has also been developed by engineering students in Ferozepore. I congratulate Prof. Bharat Raj Singh for doing something different.It is a commandable job from pollution point of view. However, getting compressed air using conventional electricity is ok from research point of view but not practical point of view.The reason being that rechargeable battery is a better option.If sun energy can be converted into compressed air by a mechanical device acting as a recharging mechanism for air engine,it would be wonderful. Thank you very much for the comments and advise. I have already suggested in my research paper to utilize solar energy, wind energy, muscular / physical power and animal power to compress the air and store it in Energy Tank. Such energy can be utilized whenever it is needed, to run air turbine or even for running domestic appliances too. running on same principle. it is 4 wheeled vehicle we want power upto 6kw to run the vehicle at 30km/hr. so can u give us suggession which motor we use to drive the vehicle. we are using compressor tank to store compressed air.pls also give us suggession is there any improvement we have to done & give u r contact no if it is desirable so i can talk with u directly. Thank you for the inquiry. First I would like to ask you that for 4-wheeled drive you have to select engine of about 500-700 cc minimum displacement.Thus 6kW power may not be sufficient to drive 4-wheeled vehicle. It may require minimum 9-10kW power for any light vehicle. It is suggested that you have to go far any reciprocating engine and make it 2-stroke in-place of 4-stroke by changing its cam shaft rotation to avoid suction and compression stroke, which is not required in any air engine. Such engine can easily run on compressed air, but you have to have 2- tanks of larger capacity with highly compressed to the order of 200-300 bar pressure. For further details, you can contact me at 9415025825. My detailed profile is also available at http://www.brsinghindia.com. i will call you soon..
a request is that plz deal with some good indian company. i just want to know that how much weight this bike can carry. how that weight effect the performance of this bike. Are you going to collaborate with trusted Indian companies like Tata, Bajaj or Maruti to commercialize it? I congratulate you and your team for doing such a work. It is indeed a commendable job . As an investor, we are interested in the Air Engine that you have developed. We would like to take it forward, and exploit commercially. However, the subject info resources are not available on your website. 1.	the costs involved to produce such an air engine to develop up to 10 KW power, assuming availability of compressed air at 30-50 Bars. 2.	what is the state of the exhaust air and what can be done of it ? 3. Can an old automobile engine be so modified ? 4. Does the engine necessarily need to be built as new ? Such an engine need not be applied for automobile applications. Just a static thing. Installed firmly on ground. Size or weight not being any constraint.